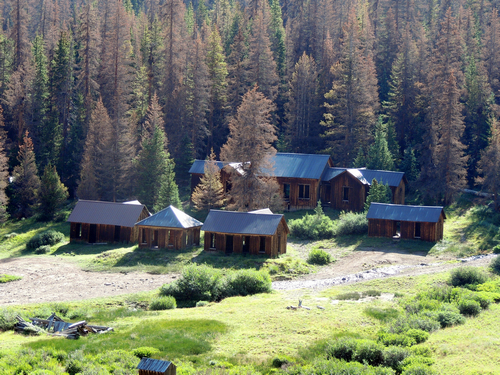 Carson was established in 1881 with the discovery of silver and gold and abandoned in 1902. The ghost town is now privately owned and has been "stabilized" by putting metal roofing on the buildings to help with snow and rot. Currently, the owners allow visitors to stroll through Carson, but this privilege is dependent on how well the land and building remains are respected. 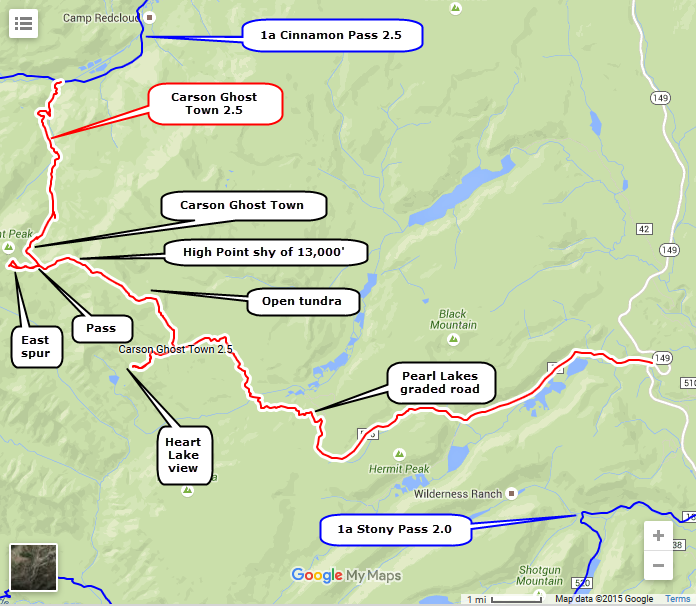 From Carson, the Jeep trail climbs another 1.4 miles to a pass on the Continental Divide at 12,400 feet. Carson is down the valley on the right of the photo below. The pass is slightly right of center, at the point where three roads come together. Take the road to the right in the photo (east) and climb toward Bent Peak. Nice views into Lost Trail Creek on the left, and back down toward Carson. The road straight ahead at the pass is a dead end and not worth doing. The road going left from the pass leads up to almost 13,000'. You absolutely have to take this road to the high point. Fantastic! This road up is shown in the photo below. If you have traveled all the way from Silverton you may want to turn around at the high point and head for home. If you have time the road beyond to Highway 149 is interesting. 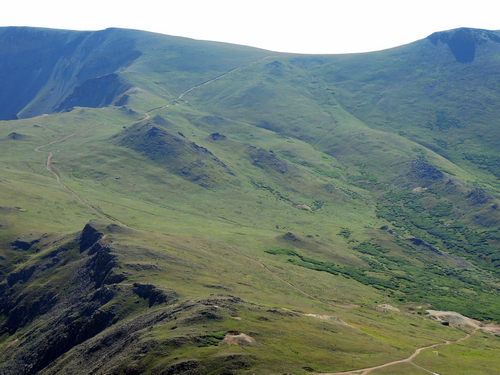 It is open tundra for miles and has great views of Pearl Lakes and many other water bodies to the east. 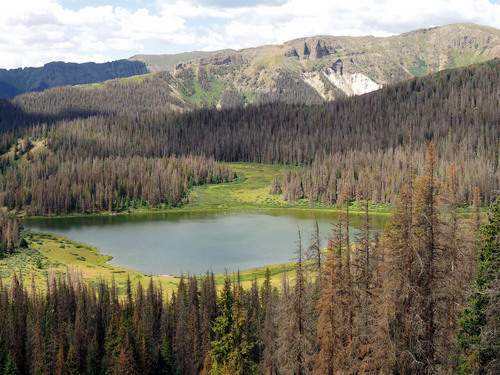 Drop down off the highest country and take a spur to overlook Heart Lake. Leave the Heart Lake viewpoint and continue down the hill. It is a 4WD trail for a few miles until you reach Pearl Lakes where there is a wide graded road out to Highway 149. 30 miles north to Lake City or 3 miles south to Stony Pass road.